The third-highest peak in Capitol State Forest is known as Rock Candy Mountain. One could easily assume that the mountain is very rocky from the name, but that was not the case for most of our hike. Hiking to the 2,356' summit had us stepping over streams, wandering under a thick forest, and crossing a few logging roads. The views on a clear day are spectacular and allowed us to see as far away as Mt. Saint Helens. We completed this 7.5 mile roundtrip hike, with an elevation gain of 1,850', in 3hrs 40mins. A large parking lot for this trail, as well as other trails and recreational uses, is about 12 miles west of Olympia off of WA-8. If you're heading west, look for the Rock Candy Mountain RD SW sign and move over into the left lane. The intersection does provide its own left turning lane so you shouldn't have to worry too much about speeding vehicles approaching from behind you. Follow this road for a short distance and the lot is on your right. Now's the time to use the restroom if needed, there are no other facilities along the trail or at the summit. When we arrived there were about ten other vehicles here. Three or so of them had trailers hooked up which were hauling ATVs. Some of the trails are mix use between hikers, ATVS, bikes, and more. However, all the signs we saw indicated the trails were closed to motorized use from December 1 to April 30. It was April 2 when we visited. We heard some motorized vehicles during our hike but we never came across any besides here in the parking lot. There's an information board in the parking lot with a detailed trails map. We used our phone to take a photo of it. Google Maps shows the roads on the mountain but does not list any of the trails. During our hike we referred to Google Maps and the photo a few times. We started our hike at the Rock Candy Trailhead. The trail started out with some boardwalks and paver-type blocks embedded in the dirt. We passed by a creek and plenty of wildflowers blooming. Shortly we reached an intersection. Taking a left, over the bridge, continues Rock Candy Trail. We opted to go right and head down North Rim Trail. A previous trip report we read suggested this route so we gave it a shot. It was a great day out. The sun was piercing through the trees, the temperature was in the low 70s, and it felt like our first real Spring hike of the season. We encountered a group of 4-5 people on their way back shortly after we began our hike. We also came by a helpful couple as we were nearing the top. They let us know the conditions of the trail and how much further it was. On the way down we passed by a runner who was heading up. The beginning, lower elevation of the trail had a lot of mosquitoes. Bring some bug spray! As you continue your hike keep an eye out for Trilliums, they are everywhere right now, along with many other flowers. Before long we came to a 3-way intersection, all routes had the same name, North Rim #1. We figured it was a loop and we continued to the right. Parts of the trail were muddy with a few spots that had water pooled up, nothing impassable. We never encountered any downed trees or obstacles. We eventually merged onto a road. We continued in a southwest direction with the road starting to climb at a steeper incline. There was an unmarked trail off to the left but we choose to stick to the road for a little longer. 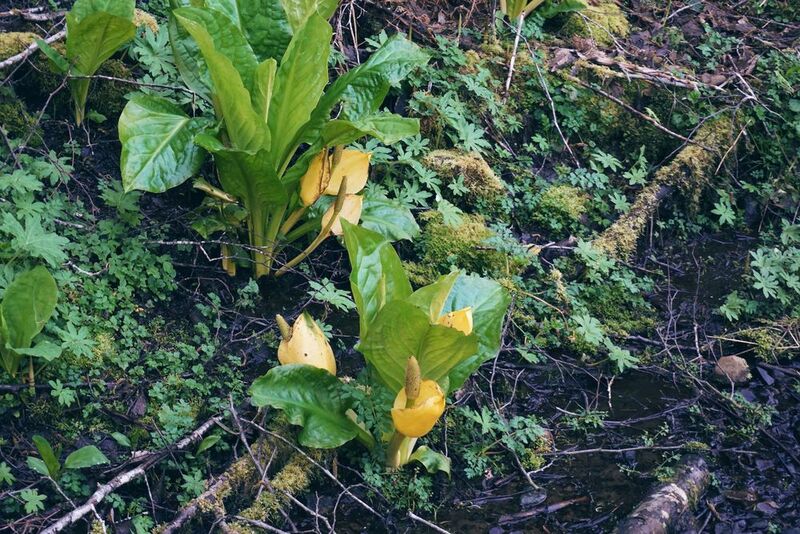 We crossed a stream, passed some skunk cabbage, and eventually made our way back onto the trail. At this point the climb was steeper and we were in a set of switchbacks. Like the beginning of the trail, those paver-type blocks were everywhere here, mostly around the turns for erosion control is what we assume. Before long we came to another road with a lot of trail signs. Not one of them said Rock Candy Mountain. This is where we met the couple. They told us to head up the road, which connects to another road, which leads to the top. That's what we did. This first road was older, rocky, and steep. Lots of loose chunks of rock covered it. This is the only time the name "Rock Candy Mountain" made sense. It wasn't long before it met up with a well maintained, smooth dirt road. We made a left on it and continued to the first viewing opportunity. Although we weren't quite at the summit yet, a clear viewing area off of the left of the road provides the only chance to see the landscape to the east. From here we could see Puget Sound, Mt. Rainier, Mt. Adams, and Mt. Saint Helens, which was just visible through a bit of haze. It was quite remarkable scenery. We tried to spot Seattle but were unable to. After taking numerous photos we continued up the road. The road winds around the mountain top and eventually there is a open viewing area to the west. Lots of rolling hills that way. We assume the Pacific Ocean is within view from here on a clearer day but due to the haze in the distant we could not see it. As we made our way further up the mountain, and to the north side of it, the Olympics were in sight. There was very few opportunities to get a clean shot of them without tree tops getting in the way. But the sight of them was amazing in person. We were also able to spot the parking lot below us. It certainly did not feel like we hiked as far away as it looked. Winding up the mountain even more and we came across another road leading off to the east. We knew sticking to the current route would bring us to the top but we wanted to take a quick stroll down this road to see if there were any more viewing opportunities. There weren't. But there was a lesser used trail that we got on and it brought us to the top. At the very top the Olympics and the Sound were still visible. Trees prevented us from seeing out towards Rainier. We took a short break and began down the road, stopping again at the only available spot to see Rainier for more photos. On the way back, once we were to the point where we met that couple, we chose to continue down that rocky road and find another route to the parking lot. We came across Divide Trail North on our left and took it. This was much steeper than the way we took up and was rutted deeply by ATV activity with frequent softball to football sized rocks. Watch your ankles! It eventually met back up to that 3-way intersection with all trails named North Rim Trail. Yes, it was odd. We noticed a few times that trail signs were either missing or named incorrectly. A beautiful day, wildflowers, trickling streams, serene forest, this was a nice hike. There were areas where recent logging had been underway, and the heavy scent of pine filled the air. The day was warm, but each new corner seemed to provide a refreshingly cool breeze. We didn't see much in terms of wildlife, but heard the singing of birds frequently and the rustling of underbrush in numerous spots. Despite the distant sounds of 4-wheelers and the occasional, far off pops from a gun range, this is a great place to quickly get away from the city and immerse yourself in nature!